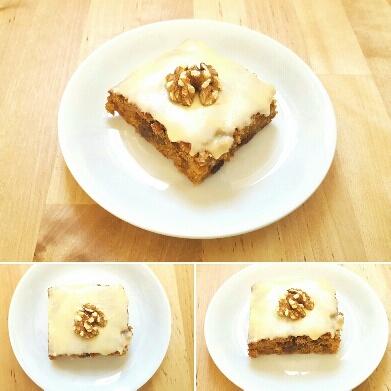 This is an incredible recipe which creates, what is in my opinion, the best carrot cake I have ever tasted. It’s really light, well spiced with cinnamon and nutmeg, and can be adapted according to individual tastes. 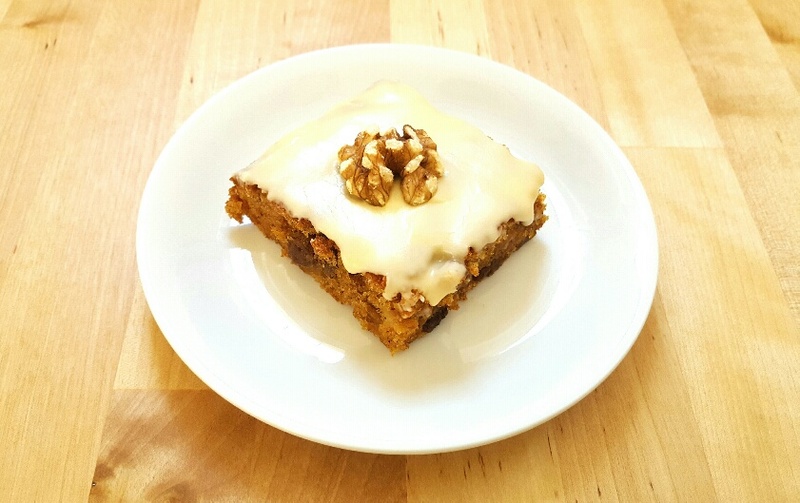 I’ve kept the spicing of this carrot cake quite conservative because I know a lot of people only like a little bit of spice in their cake, but I like to add more nutmeg to my carrot cake when I bake it. A while ago I received a present of a box of whole nutmegs and a little grater from my stepdaughter. I didn’t use it for ages, thinking that there was no real difference between it and ready-ground nutmeg, but how wrong I was! Freshly grating nutmeg releases all of the natural oils found in the seed, imbuing the dish with a heady, exotic spiciness that complements all of the other ingredients in the cake. Please give it a try if you haven’t used it before. It’s well worth it. It’s a really cheap spice nowadays and you can just use a standard kitchen grater to grate the seed. It’s fragrance is nothing short of magical! I also like to soak the raisins in hot tea before I use them because it plumps the dried fruit up, making for a moister mouthful of cake. I also sometimes add walnuts into the cake batter, but the basic recipe is delicious as it is and you could easily bake this cake as individual cupcakes if you’d prefer too. The basic carrot cake is lovely without icing, with orange icing or with cream cheese frosting (use 1 tub of lactose-free cream cheese or Philadelphia and as much icing sugar as you need to suit your own taste). Enjoy! Boil your kettle. Put the raisins and teabags in a deep heatproof bowl and cover with boiling water. Leave to soak for at least 15 mins. Overnight would be ideal, but it’ll still plump them up if you only soak them for a short while. Line a large rectangular baking tray with greaseproof paper/baking parchment. Put all of the ingredients into a large bowl, adding the bicarbonate of soda last. Drain the raisins over a sieve, picking out and discarding the teabags, and then add the raisins to the cake mix. Use an electric whisk to mix until combined. Pour into the baking tray and put it into the middle of the oven. I don’t have a cooking time as such because it depends on the size of the cake tin you use, but my cake took roughly 30-35 mins. I know it’s cooked when I pierce the middle of the cake with a skewer and it comes out clean. Leave it to cool. Add icing sugar to your orange juice to make your orange icing. Once the cake is completely cool, top it with the icing and decorate with the walnuts.